Part application launcher, part alternative dock. Overflow 3 is a popup window where you can stash all the stuff you don’t have room for in the Dock. 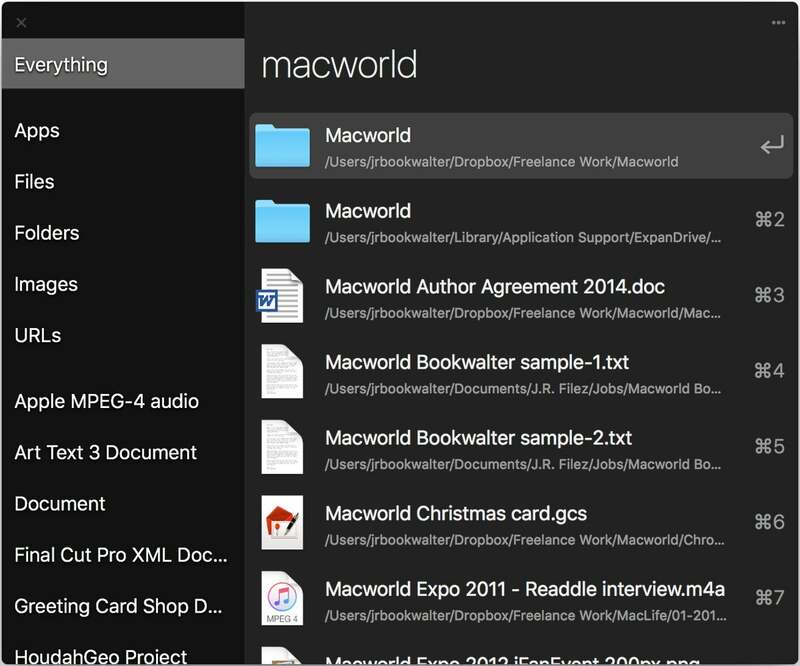 In addition to folders and files, Overflow works as an application launcher for software you might not use every day but want to be able to access quickly. Although you have the option to show or hide the Dock at all times, Overflow lurks in the background until it’s summoned, either by clicking the menu bar icon or pressing a hot key shortcut of your choice. The sparse, dark-themed window (you can’t customize the look) contains a list of categories at left, with rows of icons on the opposite side representing what is saved there. 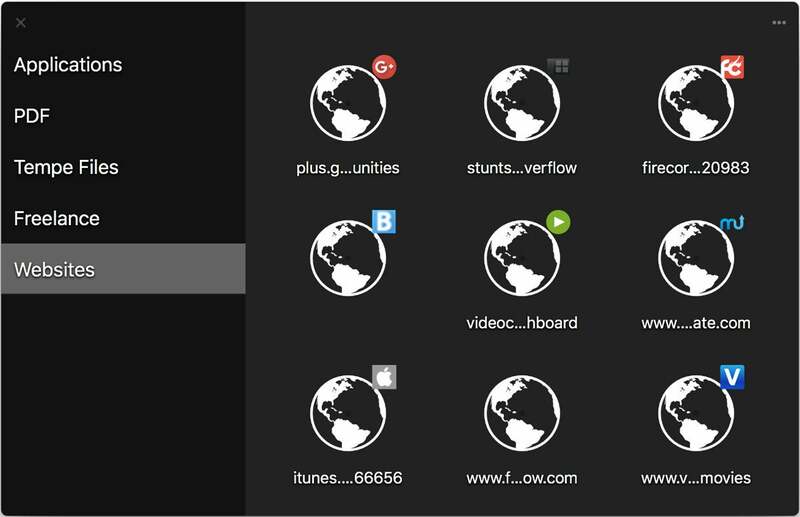 Drag URLs from the Finder or any web browser and drop them in Overflow 3 to create quick shortcuts to favorite websites. 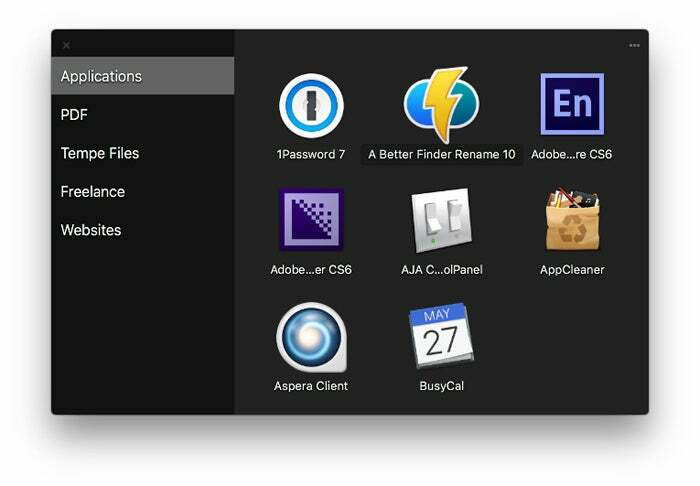 These so-called “collections” can be anything: groups of related apps (such as the expansive Adobe Creative Cloud collection), bookmarks to favorite websites, even files and folders organized into specific projects. Once added, icons can be rearranged by clicking and holding the mouse for a moment, then dragging the item to a new spot or moving to another collection. By default, Overflow 3 displays nine icons in a relatively compact space, but you can expand the window larger, and that setting will apply moving forward. New items remain where originally added but clicking the small three-dot button in the upper right corner opens a menu with options to organize items alphabetically instead. Want to organize the contents of a collection alphabetically? Overflow 3 has a shortcut for that. The convenience of Overflow 3 becomes apparent when it comes time to find a specific item. There’s no search field available, but whenever the window is open, simply start typing to instantly find what you’re looking for. Best of all, search works across your storage device, rather than only what’s been saved in the app. Keyboard jockeys can navigate Overflow 3 with arrow and return keys, navigating between collections by holding the command key while moving up and down. The window itself is like a mini-Finder; while hovering over an item, hit the space bar to Quick Look preview its contents. That last feature works particularly well with URLs, which you drag and drop from web browsers or the Finder and are updated with the latest content during preview. Overflow 3 offers lightning-fast search results. Just start typing whenever the window is in view. Because the window automatically disappears when not in use, Overflow 3 is a two-handed affair; one to control the mouse or trackpad, another to press the hot key shortcut. One improvement we’d like to see is a setting to change the size of icons, which are a little on the large side. Worth noting: The app is now 64-bit, and therefore requires recent hardware capable of running macOS 10.13 High Sierra or later.